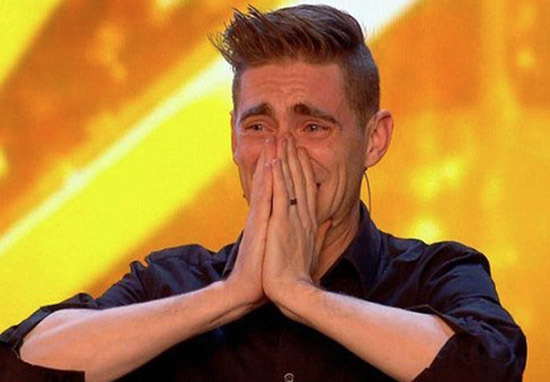 Ant and Dec used the golden buzzer to grant magician Matt Edwards a place in the semi-finals of Britain’s Got Talent. The Geordie duo were so impressed by the ‘old school’ magician – who had a ‘tequila’ themed audition – they activated their golden buzzer to grant him a place in the live shows last night. The pair legged it on the Britain’s Got Talent stage to push the golden buzzer in front of judges, meaning Matt was guaranteed a place in the sought after competition. Just before the presenters took control of the situation, Alesha Dixon had been singing the 34-year-old’s praises. We’re so distracted by you clowning and messing about that we’re not paying attention to what you’re actually doing, so therefore it’s even more magical. I really love you. I think you’re charming, I think you’re funny and I think you’re old school with a twist which is absolutely perfect for ‘Britain’s Got Talent’. The cheeky chaps were so made up they’d managed to give Matt his big break, they ran on stage as golden confetti rained down on all three. We were laughing so hard we almost peed ourselves! You’re 34 years old and for some reason you haven’t had a break yet, we just wanted to help. Matt looked so taken aback by the whole thing and their act of abrupt kindness, he broke down in tears in front of judges and the audience. It was a magical moment – see what I did there – hopefully they used their precious buzzer wisely and Matt will go on to do miraculous things… the pressure’s on.